This Chihuahua is Proud to Be An American! Dogs are great pets and usually listen well but when they don’t it can not only be frustrating but it can also be dangerous. If your dog doesn’t listen well they might dart out into the street or not stay away from other vicious animals. These are just a few reasons why you should take your time to teach your fur baby the basics. The best reward is praise, hugs and cuddles but if needed a few treats here and there are Ok too. By rewarding them with love and not just food it will create a stronger, special bond with them. Once they trust you, they are dedicated to you for life! First off, here are a few tips. Clickers actually work really well when training and don’t cause health problems like giving them excessive treats can. Always make sure there are not any distractions and when you make the dog do an action like sit, press gently so you don’t accidentally hurt your pooch. Method 1 of 5: The Sit Command – Get some of your dog’s favorite treats, whatever they might be. These will help to entice your dog to listen to you. It helps if the treats are quite small. Don’t give your dogs the treats that your dog can’t chew as this will teach aggressiveness. Hold one treat out to your dog so that he/she can smell it, but not eat it. With the treat firmly in your grip, just above his/her nose, say in a clear tone, “Sit”. The first time the dog hears it, you need to ‘show’ the dog what to do. Give his back-end a little nudge towards the ground with a firm palm gently pushing down on his hip area (not his back) while pulling up on the leash or underside of the collar. Once the dog finally sits, say “Good boy/girl!” and reward him/her with the treat. It is important that you do not repeat the word “sit.” Say the command once, and then enforce it. Repeat these steps until the dog begins to associate obeying the command with getting the treat and verbal praise. Once the dog is comfortable with the trick, eventually stop giving treats to your dog. Method 2 of 5: The Down Command – Again with the treats and verbal praise. Have your dog sit down, as long as you were successful with the above instructions. If you were not, getting your dog to lie down will be an even tougher challenge. Once your dog is sitting, hold the treat on the floor, out of the reach of her/his mouth, so that he/she will have to lie down to get the treat. In a clear, firm voice, say “Down” or “Lie Down” or “Lie”. If necessary, hold the treat on the floor and gently sweep out his/her front feet so they are forced to lie down. Give him/her the treat and say “Good Dog!” Eventually try to wean the dog off the treats, and respond just to your verbal command. Method 3 of 5: The Roll Over Command – This goes with the Lie Down command, if this was hard to get your dog to do it may be hard to get them to do this. Show the dog the treat. Have them lay down. 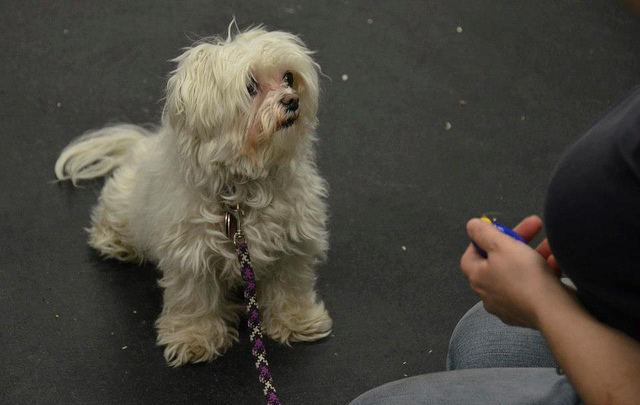 Say roll over and Bend down to the floor and do slow circles with the hand with the treat. The first couple times you do it you may have to help roll over. After a while you want them to respond to the words and the hand signals. Method 4 of 5: The Stay Command – Have your dog sit and then have someone else hold your dog by the collar. Stand in heel position (dog facing the same direction as you, with their head and shoulder lined up with your leg, hip, and shoulder). Put your hand about 3-5 inches from your dogs face and say stay. Walk 6 feet away and turn around facing your dog. Start off only standing there for a few seconds then gradually build up. Starting on your dogs left side walk around the dog, ending in the heel position. Praise! Fade out the holder. Repeat the same for teaching the down stay. Method 5 of 5: Teaching Your Dog to Shake – Have the dog sit. Grab one of the dog’s front paw’s and shake it. Tell the dog the command “shake”. If you find yourself losing your patience while training your dog just take a 20 minute break or try again the next day. The last thing you want is for this process to be intimidating for your pooch as it could deter them from learning any types of commands.